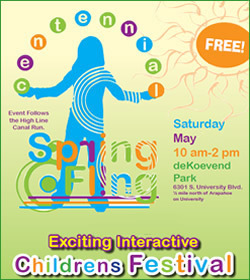 The Centennial Spring Fling is a Childrens Festival held annually immediately following the High Line Canal Run. The event features Balloon Sculptors, Face Painting, Inflatables, Pony Rides, Rock Wall Climbing, and more! Life size chess and checker games are very popular – as well as Chutes and Ladders, High-Ho-Cherry-O games for the whole family. Don’t miss this FREE event put on by the City of Centennial and the South Suburban Parks and Recreation.